Do you know the best way to keep your child safe while you are in transit? Often families get so caught up in the planning, packing, and preparations for a family getaway that they don't remember that their mode of transportation may not already be child-safe. Airplanes, taxis, and loaner vehicles are rarely equipped with properly installed safety devices; so what is a parent to do? Bringing your own car seat or booster is the best option! Thankfully, there have been great strides made in developing safety seats that can be easily transported. For example, The Car Seat Lady recommends several fabulous options ranging from infant carriers that easily snap to compact strollers to combination stroller car seat/booster options. These are great because they not only offer a safer seating option for flights or other vehicular transport, but they can be rolled (with a child it in!) through expansive airports or along sidewalks to taxi or bus depots; freeing up parental hands, and saving backs and sanity! A last resort if you forget or cannot bring your own car seat or booster, is a rental car seat. Because it is impossible to know for certain if a rental seat has sustained an impact in a crash, it is always best to bring your child's own car seat; but a rental is better than nothing at all! If the taxi or rental car agency offers to provide a safety restraint seat for your child, be certain to check that it is appropriate for your child's age, weight, and height. Also be certain it is properly installed and that it is in working order with no broken straps or latches. 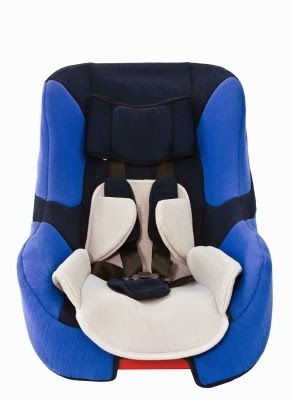 The National Highway Traffic Safety Administration website provides a fabulous page with age-appropriate safety seat guidelines if you are unsure of what type of seat to request. Never buckle more than one person into a car seat belt. Buckling more than once person into a car seat presents the risk of the top person being fatally crushed in the event of a crash. Never put the shoulder belt behind the back or under the arm of a passenger. Be vigilant about seat belt use for everyone riding in the vehicle; studies have shown that restrained passengers are 4 times more likely to die if someone else in the car is not restrained. Used properly, car seats and seat belts save lives... a little planning and research can provide you with the knowledge you need to determine which option will best suit your unique needs. Safe travels!